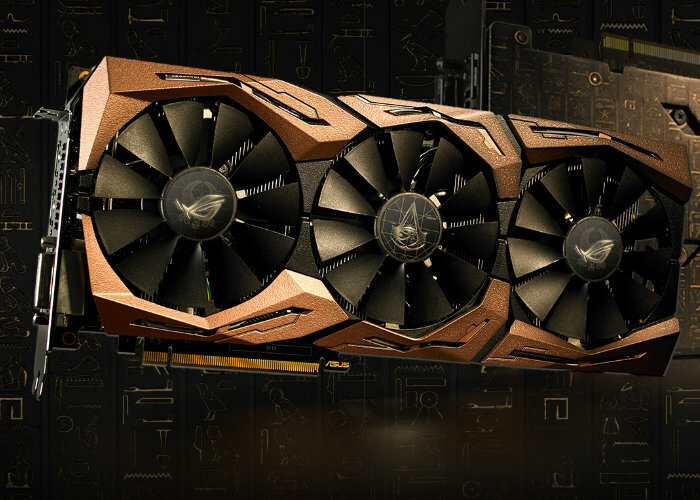 In conjunction with the launch of the new Assassin’s Creed Origins game, ASUS has unveiled its latest ROG Strix GeForce GTX 1080 Ti Assassin’s Creed Origins Edition graphics card which is equipped with a special cooler shroud finished in a bronze-gold die-cast colour. Apart from the Assassin’s Creed Origins graphics the card is identical to the ROG Strix GTX 1080 Ti OC. Offering out of the box clock speeds of 1569/1683 MHz (core/boost), and an untouched 11 GHz (GDDR5X-effective) memory. The ROG Strix GeForce GTX 1080 Ti features Aura RGB Lighting on both the shroud and backplate, ROG Strix graphics cards are capable of displaying millions of colours and six different effects allowing users to personalise their rig and colour coordinate as required. The ROG Strix graphics cards also features ASUS Aura Sync, RGB LED synchronisation technology enabling the graphics card to be paired with an Aura-enabled gaming motherboard. 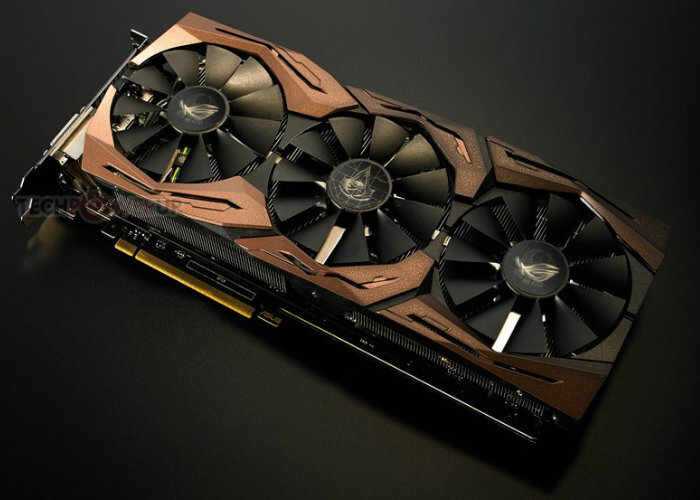 ROG Strix GeForce GTX 1080 Ti Assassin’s Creed Origins Edition is a limited-edition version of our flagship gaming graphics card, coursing with extreme power to deliver the highest frame rates and smoothest performance — and exclusively enrobed in the colors of the brotherhood. Decorated on the rear side with insignia of the Assassin’s Creed, only 500 of this meticulously-engineered and carefully-crafted design will ever be made. Strix GeForce GTX 1080 Ti Assassin’s Creed© Origins Edition is a pumped and primped collectors’ piece destined to be the envy of all. 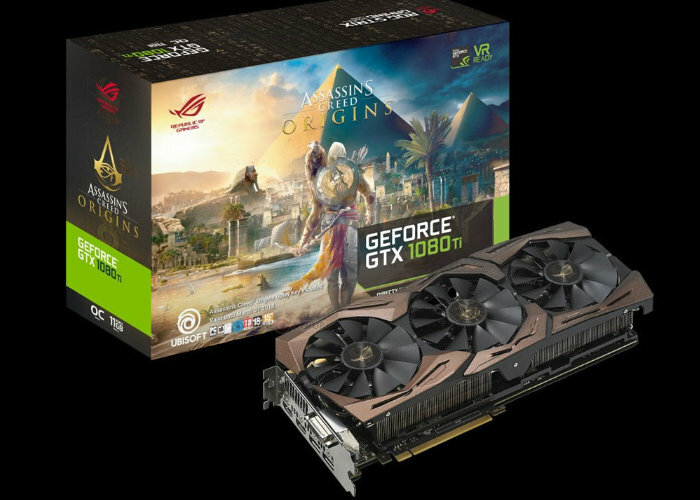 ROG Strix GeForce GTX 1080 Ti Assassin’s Creed Origins Edition draws on the game’s backdrop of ancient Egypt for its distinctive design. The iconic ROG eye joins the Assassin’s Creed insignia on a rear wall of hieroglyphs that appear as to be carved into weathered granite, while the front-side features a shroud that’s reminiscent of the copper tools originally used to create these mysterious engravings — setting the scene for the long journey that lies ahead for Bayek of Siwa.